Ditch The Belly » 21 Day Fix – A Game Changer! 21 Days to make healthy habits that last a lifetime! I truly believe the 21 Day Fix will be a game changer for so many people I want to share it and encourage as many as possible to try it. Ok, why am I so excited? Because it worked for me and I know it will work for you! These are my results from April 2014, the first of many times I have completed the program! In fact, I haven’t stopped eating 21 Day Fix style since I started. But here is my story from my first round: 21 Days is all it took to lose the 7 pounds and 3 inches I had packed on over the football and holiday seasons. I had been out-eating my workouts for a few months and was getting frustrated. Nutrition has always been my struggle. I can workout all day but given the choice between a vegetable and ANYTHING else I will choose the anything else. What I discovered in these 21 days is the anything else is generally a carb! So, that’s my story. Why do I think this program will work for anyone ready to incorporate healthy changes into their lifestyle? Because it’s so SIMPLE! But let’s take a moment and answer some of the questions you may have. 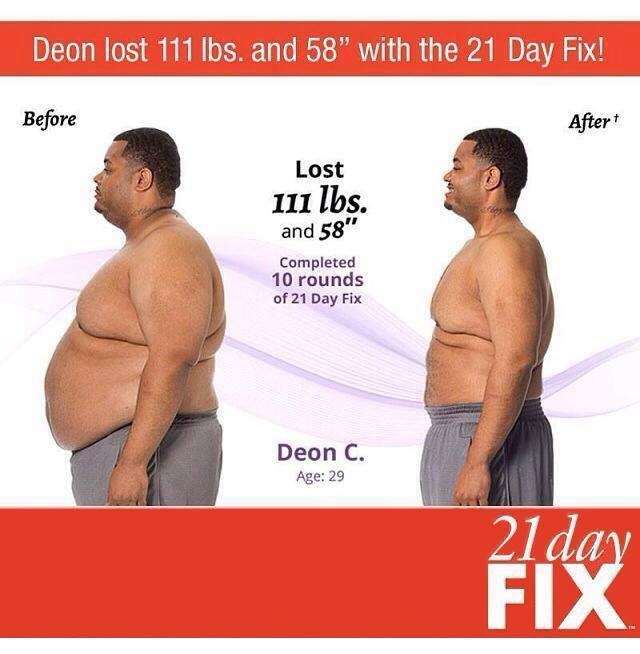 The 21 Day Fix is THE fitness and nutrition program that will help you lose up to 15 lbs in 21 days. Each workout is approximately 30 minutes a day, 7 days a week. The nutrition plan is unique in that it supplies you with specifically portioned food storage containers that you can pre-pack, pre-plan and that help you eliminate the guesswork from portion control. No weighing, no measuring, no counting calories, carbs, macros, or points. If it fits in the container, you can eat it. If you are healthy enough for exercise, you can do the Fix! Any age. Any Fitness Level. Both men and women will see great results. Each workout has a modifier to show easier moves. The Beachbody test groups included fit people as well as people with 100+ pounds to lose, to be sure that anyone could be successful with this program. Each workout is appropriate for ALL levels of fitness. Seriously, I mean ALL LEVELS! The workouts are very simple so that beginners will not have a problem following. At the same time, intermediate and advanced users will be challenged with the various workouts in the program. 21 days, but once you own the kit it’s yours! Many people repeat the program if they have bigger weight loss goals. Because it’s not a “diet” you will be living a healthy, sustainable lifestyle without worrying if you are getting enough calories/nutrients. The workouts are also super simple. Super simple and as tough as you want them to be! I’m a P90X fanantic, while the moves in the Fix are a whole lot simpler, they are just as effective. I could not believe how sore I was from doing these workouts. BUT, as noted above, anyone healthy enough to exercise can do them. There are ways to modify each move to bring it down to a beginner’s level and beginner’s will get awesome results too. The workouts are 30 minutes long and vary daily. In the base kit you’ll have fun with: Dirty 30 workout, Total Body Cardio Fix, Upper Fix, Lower Fix, Pilates Fix, Cardio Fix, and Yoga Fix. A different workout every day of the week so you don’t get bored! In the Ultimate kit you’ll get all the workouts from the Base kit and also Flat Abs Fix and Barre Legs. What does the nutrition plan look like? The nutrition plan is super easy! 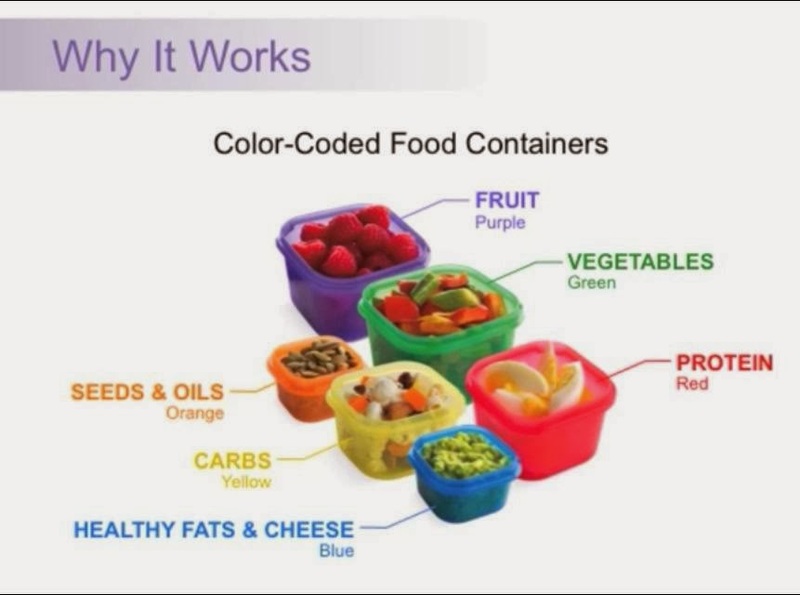 When you order the 21 Day Fix, you receive color-coded pre-portioned food storage containers. The hardest part – knowing how much food to eat – has been done for you. Because the containers are already measured out for the perfect portion, you don’t have to count calories, count your fat, protein or carbs, or do much of anything – except eat! The containers are easy to carry with you, and they are microwave safe, top-rack dishwasher safe, and free of chemicals like BPA and DEHP. What if I need to modify the meal plan? The meal plan can be adapted to meet your personal needs, whether you are vegan or vegetarian, and anywhere in between. There is even a restaurant guide included, for those times when life happens and you can’t always be home to cook. Can the Eating plan be done on it’s own? For best results, the eating and workout plan is essential. Treats (like dessert and wine) are incorporated — NOT off-limits. This plan is meant to be incorporated into your lifestyle and allow you to LIVE. 🙂 If you want to go EXTREME, then all of the treats are removed but that’s only if you want to go Extreme! Challenge Pack Offer: $140 during the month of October 2015 (INCLUDES 30 day supply of Shakeology). That is a savings of $70! PLUS, I want to extend an exclusive offer to our Ditch the Belly clients to save even more! You order the Challenge Pack and we’ll give you a $30 Visa gift card as a thank-you for starting your healthy lifestyle with us! Note that Beachbody is also sure this will work for everyone and provides a 30-day money back guarantee on Shakeology AND the 21 Day fix program! That’s right, you can complete the entire 21 Days and then return it if you don’t love your results. The Beachbody test group participants lost 10-15 lbs, many of them much more after repeating the program for more than one round. By using the knowledge you’ll learn and developing the healthy habits taught to you over the 21 days, you’ll be successful in losing the weight AND keeping it off! Of course, results vary and will depend on how committed you are to the program. 1. Officially join Team Ditch the Belly by making Jeff or Amy your Coach with a FREE Team Beachbody account. 3. Plug in and engage with our Challenge Group that starts November 2, 2015! Did I miss a question you have?